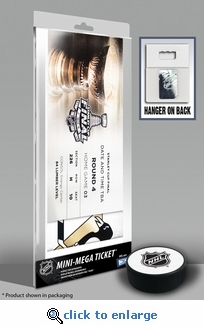 Capture the memory of the 2016 Stanley Cup Final with a Mini-Mega Ticket. DID YOU ATTEND AN NHL STANLEY CUP FINAL GAME? If so, have your ticket made into a Personalized Mini-Mega Ticket. It's a one-of-a-kind item that will capture the memory of being there. 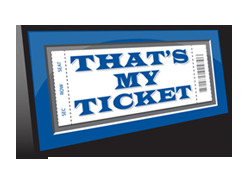 Even if you have an E-Ticket, we can create a Personalized Mini-Mega Ticket featuring your Section, Row, and Seat. Select personalized option above ($15 additional cost). Overall size: 6 (W) x 14 (H) x 1/4 (D). Capture the memory of the 2016 Stanley Cup Final with a Mini-Mega Ticket. If so, have your ticket made into a Personalized Mini-Mega Ticket. It's a one-of-a-kind item that will capture the memory of being there. Even if you have an E-Ticket, we can create a Personalized Mini-Mega Ticket featuring your Section, Row, and Seat. Select personalized option above ($15 additional cost).